AMHSI is preparing for the fall session with students coming in 3-weeks time! The AMHSI campus is really quiet with as the last summer group of students left yesterday, but not for long. AMHSI staff is working hard to prepare the campus for the fall session students, who will be arriving on August 24, which is in less than three weeks. 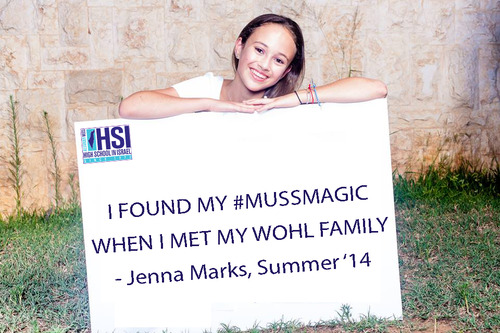 “We’re very excited to welcome these students to AMHSI in the fall. They’ll be coming for a full semester of learning, travel and fun activities, and we have some surprises in store for them, too!” said Orit Rome, Co-Executive Director at AMHSI. AMHSI has recently added several new fun activities to its regular curriculum and itinerary that will help students explore the Israeli culture, the modern reality of the land of Israel and some of its urban lanscape. AMHSI will update the students and the public on these activities within the next couple of weeks. In addition, the Fall Semester students will be the first group to take a full advantage of the Ben-Dor student radio station that has been inaugurated this summer. Students will be making their own podcats and radio programs and will learn how to operate radio equipment. Besides the radio station, AMHSI Hod HaSharon campus boasts a music room with professional instruments and sound equipment, athletic facilities such as a fitness center, a swimming pool and basketball courts and other attractions for students to enjoy. “We are excited to announce that two of the summer session madrichim (counselors), Guy and Natan, are staying for the fall session,” Yardena Spector-Nizri, Dean of Students said. “Guy and Natan were instrumental in some of the most incredible transformations I have seen in several AMHSI students in the summer session. They really invest in building relationships with the students on the program, and they care about students’ personal growth.” Added Spector-Nizri. 7. Starting to sing at random times and being shocked when nobody joins in. 6. The temperature in your room is always pleasant. 5. Still feeling an urge to cram for the final. 4. Waking up in a room by yourself is so unnatural. 3. Realizing tomorrow is Friday and desperately trying to find a broom to prep for inspection. 2. The fact that you can do your laundry at any time just doesn’t make sense. 1. Forgetting that in America telling people you don’t speak Hebrew doesn’t solve a majority of your problems! “Wohl fam and Israel, I miss all of you guys so much!” Added Ilana in her note. “We wish all our incoming students to have a "Nesiya Tova” (a good trip)! Hope the rest of your summer is restful, and we are looking forward to meeting you all in just a few weeks!“ Added Rabbi Philip Nadel, Head of School.